We first hit the track early on Thursday morning for testing. Along with my USF2000 commitments, I was also planning on making my Pirelli World Challenge debut in the GTS class. So on Thursday, I was switching back and forth between an open wheel car and a big heavy sports car. 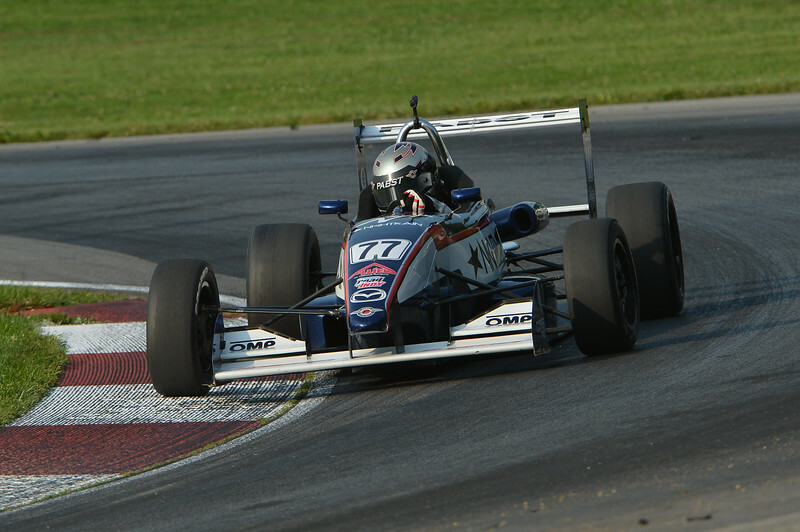 In the second USF2000 session I ended up P3. I was really satisfied with this, because this proved how well I can transition between different cars. It was a busy day on Friday, with practice, qualifying, and a race lined up. In practice we were right back on pace, ending the session P6. Qualifying did not go as great because of a tire issue, putting us back to P9. As we pulled out on the grid for the race, the sky was turning black, and if that wasn’t enough proof that it was going to rain, as we got to the backstretch before the green flag, the thunder was not the sound of our engines. As anticipated at Mid-Ohio, there was a pile up in the first turn of the first lap, gaining me two spots. After we went back green I was on the move. I had just finished passing a third car as the rain started to fall. In P4, I was close to a podium position, but this got a bit complicated as the rain started to come down harder. Five of us were all battling for one spot. With about three laps left, I went for the pass in turn 4, but so did two other guys behind me. I was in the middle of a four-wide situation. We all made it through the turn up until the exit. Trying to keep it off the car next to me, on the sealer patch, I went to power and immediately went sideways through the grass and into the inside wall. Race 1 was a bit rough, but we still had two more races left in the weekend. We left the paddock for Race 2 in the pouring rain on Saturday. 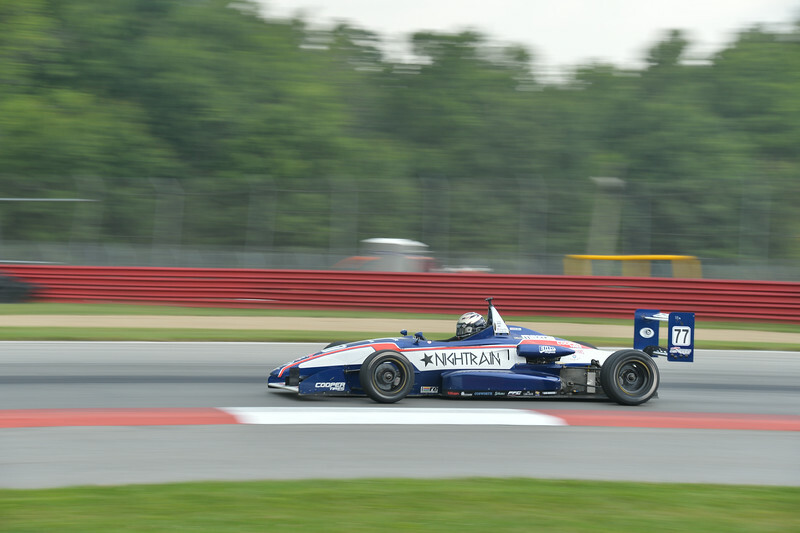 From my experience at Mid-Ohio, it is a very slippery track in the wet. Surprisingly there were only a couple late cautions in the race. I made my way up to P8 by just keeping it on the track. On the final restart I was able to grab two more spots putting me in P6. Race 3 was looking to be dry and I had a solid starting spot, P6. My start suffered a bit by being on the outside, and that the car in front of me didn’t get a very good one, pushing him down the straightaway. I got blown by, by two guys behind me before the first turn, settling me back in P8. I started putting a gap on the cars behind me and I was gaining on the cars in front of me. Lap after lap I was closing the gap, until I was right on his gearbox. Before I could get a chance to pass, he dropped two wheels out of turn 9 and I went right on by. Only a couple laps later, the same thing happened. The car in front of me dropped it off and I went past. By this time I had run the third fastest lap time of the race and the only car on track that was faster than me was the leader. Closing in fast on the next group of cars, a long caution came out and ended the race. We had a good run going, we just ran out of green laps. I am happy with Mid-Ohio, not because of the results, but because of our potential. I think that if we can carry this to Sonoma, it can bring the results we’ve been looking for on roadcourses. It stinks that the season is already so close to being over, but I’m excited to go to Sonoma because I think it will be a really good track for our cars.